Banro operates in a region that has seen incredible violence over the past two decades and the secretive company has been accused of fuelling the conflict. In 1996 Banro paid $3.5 million for 47 mining concessions that covered more than one million hectares of land in Congo's North and South Kivu. 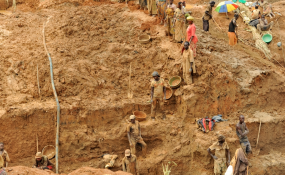 Last week a police officer and a soldier were killed at a Banro Corporation-run mine in the east of the Democratic Republic of Congo. One "assailant" was also killed at the Toronto-based company's Namoya mine. In February three police officers were killed at another Banro mine about 200 km to the southwest. An "assailant" was also killed at Twangiza in what the gold mining firm labeled an attempted robbery. Banro operates in a region that's seen incredible violence over the past two decades and the secretive company has been accused of fuelling the conflict. In 1996 Banro paid $3.5 million for 47 mining concessions that covered more than one million hectares of land in Congo's North and South Kivu provinces. At the time over one million refugees were in eastern Congo and in September 1996 Rwandan (and Ugandan) forces invaded the area. Resources fuelled the Rwandan/Ugandan invasion. Prominent Belgian Great Lakes journalist Colette Brackman produced a map showing that the zigzag progression of the Rwandan backed rebels was based on the location of minerals. Multinationals signed deals worth billions of dollars with Laurent Kabila's rebels before he took office. In an article headlined "Mining Firms Want a Piece Of Zaire's Vast Mineral Wealth" the Wall Street Journal explained: "At a time when rebel forces are threatening to topple dictator Mobutu Sese Seko, Zaire's vast mineral resources are beckoning foreign companies, prompting a scramble that recalls the grab for wealth 120 years ago in this vast land, once known as the Congo. American, Canadian and South African mining companies are negotiating deals with the rebels controlling eastern Zaire. These companies hope to take advantage of the turmoil and win a piece of what is widely considered Africa's richest geological prize -- and one of the richest in the world." Ultimately, the Rwandan forces marched 1,500 km to topple the regime in Kinshasa. After the Congolese government installed by Kigali expelled Rwandan troops they re-invaded, leading to an eight-country war between 1998 and 2003, which left millions dead. Since then Rwanda and its proxies have repeatedly invaded the eastern Congo. At the end of 2012 the Globe and Mail's Geoffrey York described how "Rwandan sponsored" M23 rebels "hold power by terror and violence" in the mineral rich east. The rebel group added "a [new] layer of administrators, informers, police and other operatives" in and around Goma, the capital of North Kivu province, in part to "bolster" its "grip on the trade in 'blood minerals'." "On 29 July 1998, just before war again started in Congo, President Laurent-Désiré Kabila annulled the Banro deal and gave ex-Sominki to a newly created Congolese state company called Somico (Société Minière du Congo) led by a Kivu traditional leader. Much of the subsequent fighting around Eastern Congo's mining pitted Banro supporters, mostly supporting the [Rwandan backed] RCD rebels and backed by business interests, against Somico supporters, mostly consisting of Mai-Mai and supported by the Kabila government." * YVES ENGLER is the author of Canada in Africa: 300 years of aid and exploitation. Copyright © 2017 Fahamu. All rights reserved. Distributed by AllAfrica Global Media (allAfrica.com). To contact the copyright holder directly for corrections — or for permission to republish or make other authorized use of this material, click here.